Directors of Rotherham's Chantry Brewery are building on the success of their real ale pubs in their home town and opening up a new venue in Doncaster. Chantry Brewery began producing quality real ale in 2012 after significant investment in the latest brewing technology installed at its Parkgate facility. Last year steelworker brothers Mick and Kevin Warburton, both co-directors of Chantry Brewery, along with close friend and one of the founder members of Rotherham's CAMRA branch Paul Vernon, took the opportunity when the Prince of Wales Feathers on Westgate came up for auction and transformed it into the New York Tavern. This year, a new company was set up to take on The Cutler's Arms, one of Rotherham town centre's historic pubs that is housed inside a Grade 2 listed building on Westgate, one of the few surviving Edwardian buildings in the town centre. Now Paul and the Chantry team have taken just two weeks to transform the empty former Garage bar on Silver Street in Doncaster from being a derelict site into their new real ale haven. Opening this week, the Flying Scotsman Tap pays homage to arguably the most famous locomotive in the world that was built in Doncaster, and also Paul's forty years driving trains on the region's rail network. Following the formula in the Rotherham venues, the Flying Scotsman Tap will feature nine hand pumps on its bar, which will stock the full range of Chantry brewed beers, a changing selection of guest ales as well as ciders and Belgian lagers. Each weekend, the venue will host a varied selection of live music. Mick Warburton, director at Chantry Brewery (pictured, left), said: "The opening of The Flying Scotsman Tap is a significant step in the growth and evolution of the brewery. Since completing the purchase of the building two weeks ago, we've pulled out all the stops to ensure that our new pub opens on time. "We've come a long way since we first opened the doors of the brewery in 2011 and the opening of the Flying Scotsman Tap will be the third venue we have opened in less than twelve months. We've noticed that sales and demand for our beers in Doncaster have been consistently high and by opening the venue, we can guarantee that our beers will be more widely available. 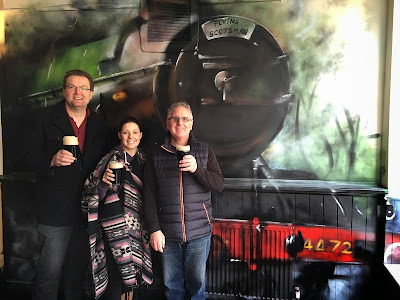 "It really surprised us to learn that despite the close connections between Doncaster and the railway industry there wasn't a pub named after the Flying Scotsman in the town, so decided that it was time to put that right."